10 Flights. 19300 miles (31000 km) distance flown. 44 hours of flight time. Nuremberg-Frankfurt-Vancouver-Portland-Vancouver-Taipei-Shanghai-Seoul-Tokyo-Munich-Nuremberg. Amazingly, non of the flights where in any way delayed. After 12 days of traveling westbound around the world I’m safe and sound back home on the Streets of Nuremberg. It was a very intense but productive business trip, and it included some opportunities to see something outside airports, taxis, hotels, and meeting rooms, and I’m very grateful for that. The best thing was meeting all those great people in Taiwan, China, Korea and Japan. But also revisiting Shanghai‘s amazing citycenter and being able to explore Tokyo for the first time was a treat. 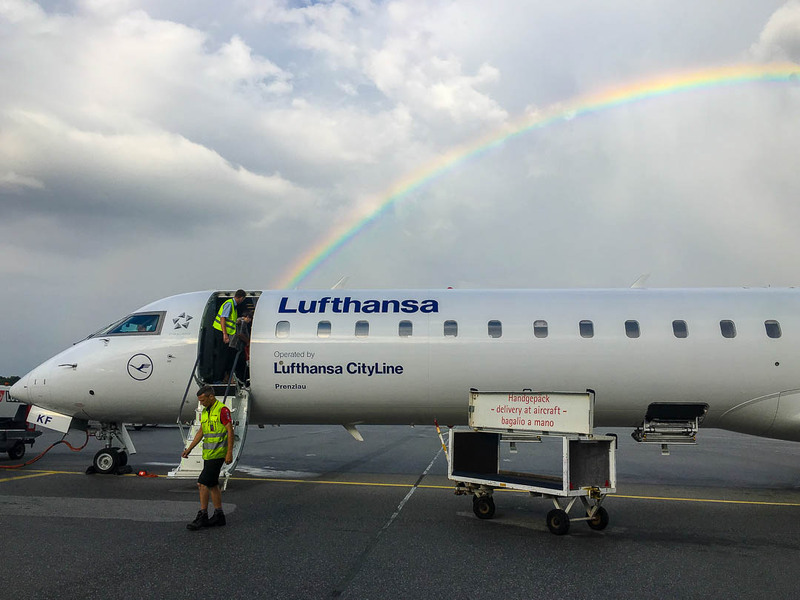 A somehow perfect ending to this special voyage was the last short flight from Munich to Nuremberg, when a rainbow graced the sky above the plane when we boarded and that pointed exactly into the northerly direction towards home. 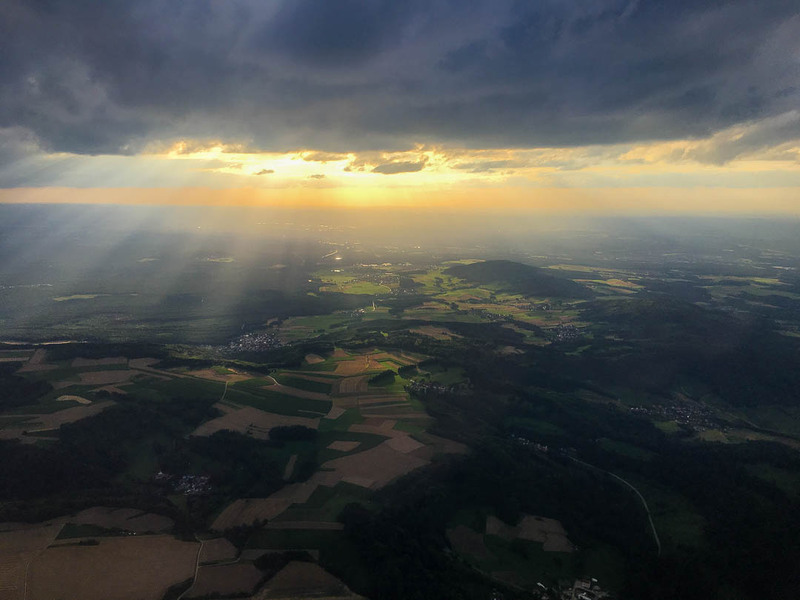 And the special light that flooded the ground near the village we live in during final approach to Nuremberg airport. I love to travel and explore the world. But it’s always good to return home. I have really enjoyed joining in with your sightseeing around the world, although admittedly in bits and pieces. Some fantastic photos and interesting commentary. Look forward to catching up with your next posts. Wow I would love to do this in the future! I made in 1970 (nearly) round the world trip. Our route was Helsinki-New York-Los Angeles-Honolulu-Tokyo-Anchorage-Copenhagen-Helsinki. Thank you for this interesting post. Tell me you are hanging that last shot somewhere!?!!! Stunner!!! Intense travel, I’m already threading the 22 hours involved getting from here to Germany with driving, layovers etc. You’ll make it 🙂 ! Glad it was a successful trip. Home Franken is a beautiful shot. Wow Marcus what an experience! Must have been marvelous. But also very tyering. Thanks for sharing. My sentiments exactly Marcus – I love to travel but home is where the heart is and I’m very content there too! A great series, thank you for taking time out of your busy schedule to post. M.